Laurence Fishburne is undoubtedly busy nursing his thriving Hollywood career, but he may want to check in with his mother. 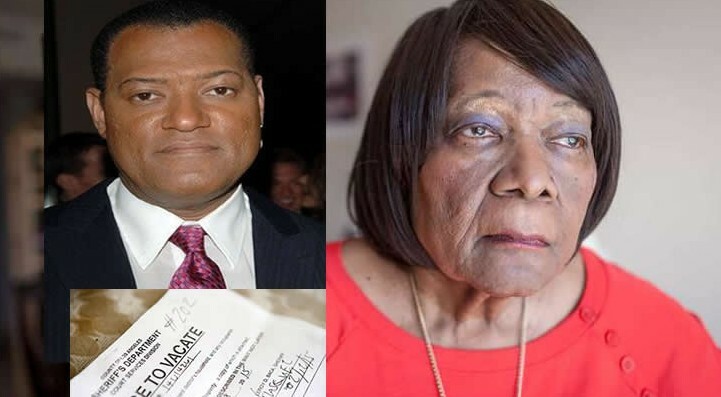 The now 80-year-old Hattie Crawford Fishburne claims she’s being evicted and can’t get a hold of her famous son. After several months of being unable to pay her rent, the retired teach received a letter notifying her that she would soon be booted from her Los Angeles apartment. While the likely solution would be to call her successful son, Hattie admits she hasn’t spoken to Laurence since his father passed away over a year ago, and she’s not happy about it. After divorcing her husband when Laurence was a young boy, Hattie raised her actor-to-be son as a single mother in New York City. This isn't the first time Hattie has been evicted, however. In 1994, the former math and science teacher made headlines when she was booted from her Brooklyn apartment and – according to Hattie – forced to live with a gal pal. Laurence, on the other hand, has only sung his mother’s praises, publicly at least. In 1999, he brought Hattie to the Kennedy Center Honors gala where the pair met President Bill Clinton together. Though things have clearly changed since then, Laurence – who is currently filming the upcoming season of Hannibal in Toronto – could not be reached for comment. Hattie’s apartment manager claims circumstances have changed, but Laurence’s mother still fears she'll be evicted.